Billboard ads, newspapers, magazines, television, the computer, and now, the internet -- we are bombarded with images. So many images, in fact, are thrust upon us on a daily basis that we have lost sight of the power that a single image can convey. The magic inherent in a seemingly simple photographic image, however, was not lost upon the pioneers of photography. Men such as George S. Cook, John Soule, George Barnard, and Mathew Brady instantly recognized the power of the new medium. These early photographers used a complex mixture of light, darkness, contrast, tone, and composition - much like an artist uses paint - to create powerful images that still speak to us today, more than 100 years later. An early image taken in 1865 by George S. Cook inside the walls of Fort Moultrie. Entrepreneurs of the mid-1800s were quick to employ the new photographic technology to grab the attention of the public. 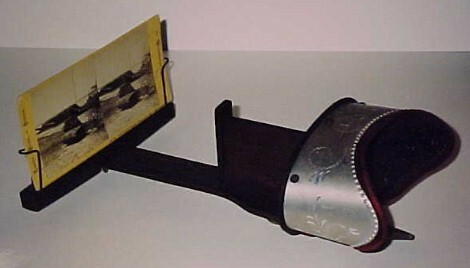 The stereographic camera, invented prior to 1850 and in commercial production by 1854, was soon in wide used around the world. This camera had two separate lenses, and the glass negatives that resulted reflected this innovation. Each photographic subject was represented by a pair of images, one taken at an angle slightly offset from the other. These glass negatives were then used to manufacture the popular stereoview cards that some of us remember from grandmother's parlor and occasionally find today in antique shops and flea markets. By use of another simple, but ingenious, device called a stereoscopic viewer (or stereoviewer for short), these flat, two-dimensional images were transformed into vibrant, three-dimensional tableaus. Grandmother, sitting quietly in her front parlor, could be figuratively transported thousands of miles into the midst of a beautiful landscape or a terrible disaster. Popular stereographic subjects of the late 1800s and early 1900s included views of Yosemite National Park, Niagara Falls, the Civil War, the San Francisco earthquake, the great Chicago fire, foreign cultures, U.S. presidents, and European royalty. Many a Victorian-era evening was spent enjoying the latest stereoviews with friends and family. The South Carolina Lowcountry, comprised of the coastal areas surrounding and including the cities of Charleston, Beaufort, and Georgetown, proved to be a fitting subject for the stereographic photographers of the nineteenth century. The area's mix of beautiful scenery, exquisite architecture, Southern charm, and local flavor, coupled with a historic past, made it a favorite of many photographers of the day. Charleston photographers such as George S. Cook, George Barnard, Quinby & Co., F.A. Nowell, Osborn & Durbec, and S.T. 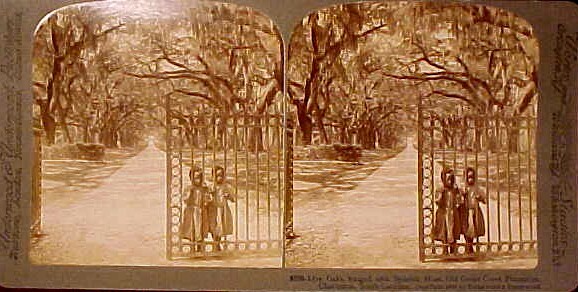 Souder, as well as Beaufort's Sam Cooley, offered hundreds of different stereoviews of local subjects at their studios. A view of the fine homes at South Battery taken by George Barnard circa 1870. Note his photographic wagon at the left of the view. Unfortunately, the dawn of the twentieth century sounded the death knell for stereographic photography. Newer and more interesting diversions such as radio, moving pictures, and later, television, turned a once breathtaking innovation into yesterday's obsolete curiosity. But fortunately for us today, the powerful images grandmother enjoyed in her living room are now being rediscovered in her attic. Once again, enthusiastic viewers are being transported into exciting, three-dimensional worlds of beautiful scenery and important historical events - not of the present day, but of times past. - excerpted from Images of America, South Carolina's Lowcountry, by Tony Chibbaro, published by Arcadia Publishing Company of Charleston, SC. Copyright 1999 by Tony Chibbaro. All rights reserved. If you are interested in purchasing this book, check out the announcement at the bottom of this page, or click on the following link: Books. Below are listed a few stereoviews showing scenes from South Carolina as the Palmetto State appeared about 100 years ago. I find these photos fascinating in their realism, showing truly how it was at the turn-of-the-century. I also like these views because of my corresponding interest in tokens and medals. They present a fine visual record of how things were when tokens were in use on virtually every Main Street in the state. If you see any views that you wish to purchase, please follow the "How To Order" instructions at the bottom of this page or email me at chibbaro@mindspring.com . Thanks. This portion was updated on September 11, 2000. If you are interested in stereographic images of South Carolina, you may want to purchase a copy of my new book South Carolina's Lowcountry, recently published by Arcadia Publishing Company of Charleston as part of their Images in America series. The book is 128 pages long, softcovered, and contains over 200 images taken directly from stereoviews of the coastal area of South Carolina. Numerous Civil War era views of troops (both Confederate and Yankee) are reproduced inside, along with early post-war views of the Charleston, Beaufort, and Georgetown areas. To learn more about the book and how to order, please visit the link: Books. To order any of the above stereoviews, please email me at chibbaro@mindspring.com or use the email link at the bottom of this web page. Let me know which items you wish to purchase and I will respond with mailing instructions and total amount due. Order with confidence, I have over 15 years experience in dealing with South Carolina collectibles. All items guaranteed genuine. 7 day return privilege in unopened original holders only. I will accept personal checks or post office money orders made payable to: Tony Chibbaro. Personal checks take 7-10 days to clear, post office money orders get immediate shipment. Buyer to pay for shipping and insurance. South Carolina residents must add 6% sales tax. All items are subject to prior sale. Many listings above are represented by multiple specimens, the item that you purchase may not be the exact same one that is pictured.